The formerly Takapuna-based boutique manager, Pathfinder, has sold down a 51 per cent stake to Alvarium Wealth Management, a newly-created consortium majority-owned by the $25 billion global asset manager LJ Partnership. Last year LJ Partnership (due to adopt the Alvarium Partners name) along with Christchurch investment firm Tailorspace bought half of another Auckland fund manager, the absolute return investment specialist NZAM. LJ Partnership and Tailorspace (the investment firm of high-powered Christchurch businessman, Ben Gough) own about 70 per cent of Alvarium Wealth with NZAM associates holding the remaining 30 per cent. John Berry, Pathfinder CEO, said the deal would boost the firm’s ability to grow in the rapidly-expanding sustainable investment market in NZ. In 2017 Pathfinder, which manages about $140 million through a range of retail funds and wholesale clients including Ngāi Tahu, rebranded under the ‘invest responsibly’ tagline. Berry said the NZ sustainable investment market was poised for further growth in line with global trends that have seen environmental, social and governance (ESG) factors enter mainstream discourse. “There’s a real opportunity to grow this space in NZ,” he said. Pathfinder would also tap into Alvarium’s global resources while potentially sharing back-office and compliance duties with NZAM, Berry said. Andrew Williams, the LJ Partnership co-founder who divides his time between his Auckland home and the London head office, said Pathfinder added an ESG capability to the global group. He said as well as supporting Pathfinder to expand in the local market there could be offshore opportunities including fund flows from the Alvarium (LJ Partnership) networks. LJ Partnership describes itself as a “research led investment firm providing customised solutions to sophisticated clients”. The business provides direct investment, fund management as well as trust and administration services across eight locations in Europe, the US, Hong Kong and NZ. Williams said Alvarium could buy other investment managers in NZ and offshore “when we see the right talent”. “If we find the right people we will continue to grow the business here and in other regions,” he said. Berry and Pathfinder co-founder, Paul Brownsey, retain substantial (and equal) ownership in the firm with Rebecca Thomas, head of Mint Asset Management, and well-known company director, Sandy Maier, also holding a small bloc of shares each. 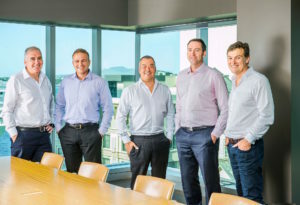 Following the Alvarium deal, Pathfinder moves this week from its briefly-occupied Takapuna office to new Auckland CBD premises in Zurich House, which also includes NZ Funds Management, the NZX and the NZ Superannuation Fund as tenants.